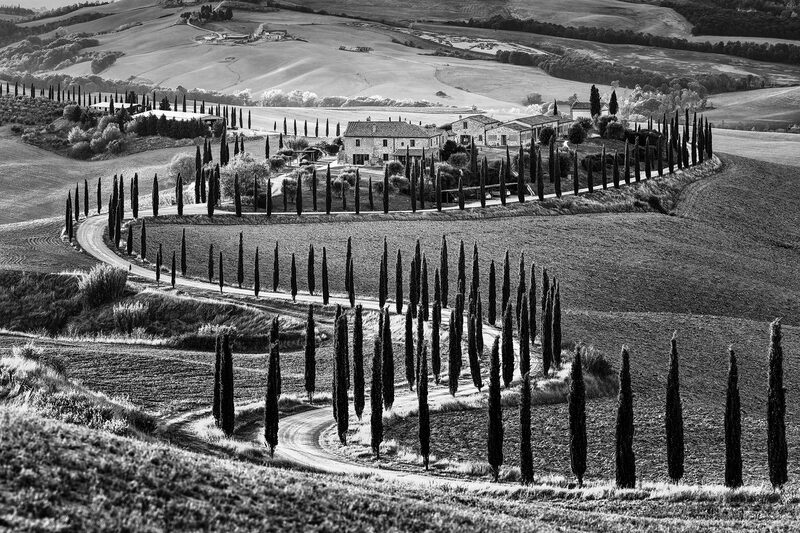 Breathtaking landscapes; serpentine roads lined with cypresses and pines. The farmhouses and country estates surrounded by fields, nestled in gently rolling hills. 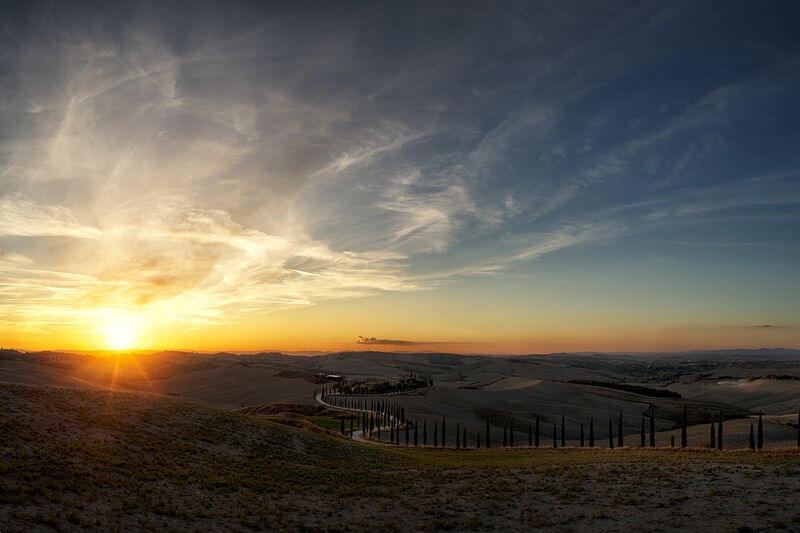 Southern Tuscany, a UNESCO World Cultural Heritage Site, has been sculpted and shaped by humans for thousands of years. Within the framework of the workshop, we will explore the most beautiful locations in Southern Tuscany in a small group of max. 5 participants. First and foremost, we want to have fun, enjoy the scenery, and enjoy the local food and wine. Like I said in the beginning, a glimpse of “Dolce Vita”. The workshop is aimed at experienced photographers who have already developed a good understanding of the magic triangle of aperture, ISO, and shutter speed. Something in a scene attracts you to photograph, “make” an image. We want to match our mind’s view, with the scene which is already there. With our camera, lenses and all the tools at hand, we want to develop as Edward Weston said, “The strongest way of seeing”. We will come back to a scene at various times and look at it from various angles, to get closer and closer to the most compelling and interesting result: The final image. Consequently, we will discuss post-processing and conveying a goal-oriented workflow. For this purpose, we will use various software products, such as Adobe Lightroom and Photoshop. Additionally, we will use specific software such as Photomatix , Autopano, or any other panorama stitching program you prefer. Most of the time, however, it is not necessary to access the additional plugins because Lightroom and Photoshop are also very good with these tasks. We will set-up our base in a very good B&B in Pienza. Some of the most beautiful photo locations in Tuscany can be reached in 20-30 minutes by car, and some are just outside the city gates. Some are a bit further away, but everything is within a manageable radius. For each day there is a location for the morning and one for the evening to get the most out of sunrise and sunset. There is at least one full-day daytrip planned to soak in even more of the culture and scenery of Tuscany. What do our workshop days look like? Departure to our morning location is about one hour before sunrise. After 2-3 hours, we will return to Pienza, have breakfast, and freshen up. 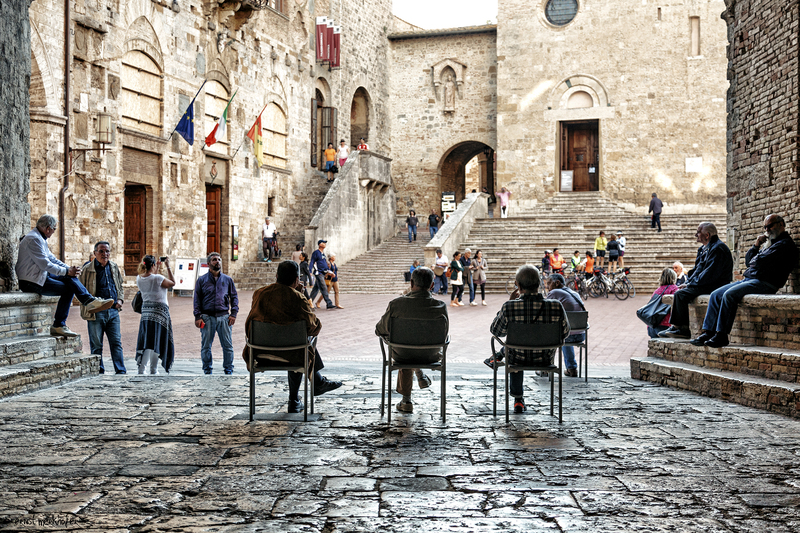 Afterwards, we will dedicate ourselves to street photography by visiting a small town or larger city like Siena, Florence, or Arezzo. These will also be our targets if the weather is too bad for anything else. In late afternoon, we will set off for the evening session where we will briefly discuss the situation at the location and start playing with the possibilities. 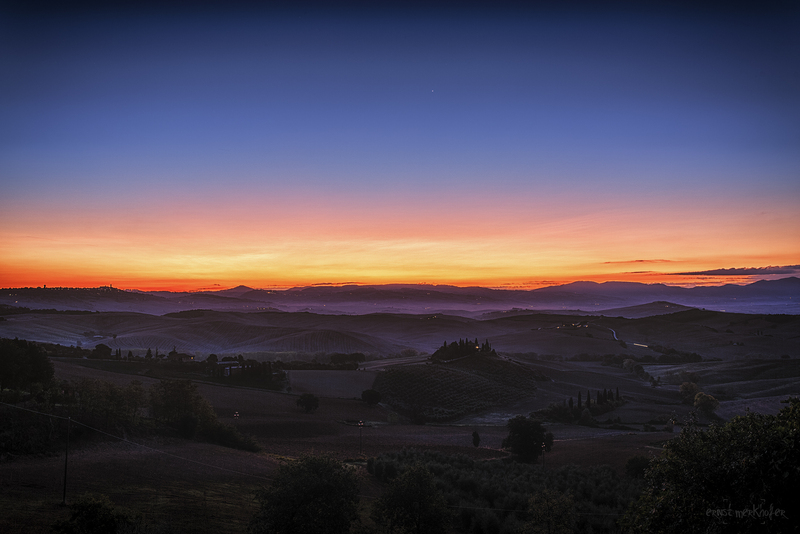 After we have enjoyed the blue hour, we will return back to Pienza or have dinner at an Osteria/Ristorante near the evening location. For panoramic and long-term exposures, we will always use a tripod. We will use gradient filters or ND filters to create a certain look in the image. We will talk extensively about this on location. We are in no rush and will use our time to understand the location and to see the patterns and shapes to pursue your goal of “The strongest way of seeing”. Special note: If conditions allow, there are several locations for a night out, under the stars. Develop a feeling for difficult light conditions and solve and master these with HDR „bracketing“ or filters. Handling of tripod and panoramic tripod head. Post-processing of the pictures with appropriate software. Ernst Merkhofer will lead the workshop. Any questions that may arise will be addressed directly by him. Transportation during the workshop will be in one minibus in order to keep our footprint small and blend in as well as possible. Generally, we try to obey the „leave no trace“ principle. If you are looking for a tailor-made tour, just for you or your group, please contact me and I will start to organize everything to your liking. Getting to/from Pienza, car-sharing is recommended. Overnight in Pienza: Very clean and good B&B with double rooms as single occupancy. Meals are not included; we want to blend in and like to enjoy our meals at a local Osteria or Ristorante. The excellent wines of the region will be sampled and for sure will accompany our dinners. Headlamp equipped with a red light lamp. Rain protection for your camera or a small plastic bag. Small plastic tarpaulin, or a large plastic bag. (About 1 m²) for putting down camera bags/ backpacks and equipment on the soil/ground. Neutral density filters, graduated filters, for example from Lee Filter or other OEMs. Laptop for pp and editing your images. Suitable for autumn weather, raingear, in the morning it can already be pretty chilly, so think of hats, gloves and a warm jacket. Trekking shoes / comfortable hiking boots. After registration, you will receive further details. Workshop leader and organizer Ernst Merkhofer is exempted from any liability. Each participant is responsible for himself/herself and his own security and commits himself/herself with the registration / participation in the workshop to behave accordingly. Insurance is the responsibility of the workshop participant. By registering at this workshop, the participant confirms that he/she has read and understood this clause. 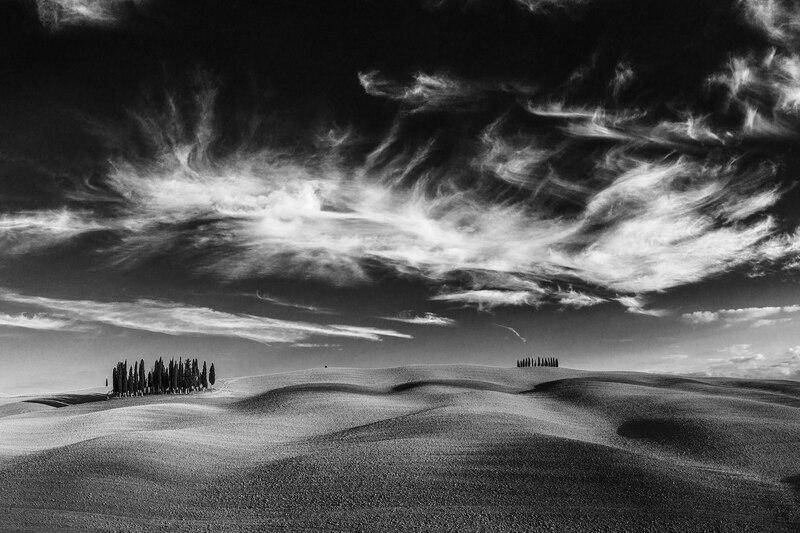 More pictures from my recent workshops in Tuscany can also be found on my site at 500px.